Lit Sabers: Here are my "working" lightsabers. 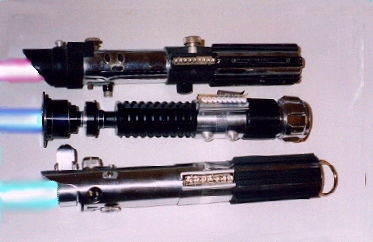 The Ben Saber is machined aluminum, resin, and a few existing parts. Notice the middle band is from a graflex. The bottom knob was "liberated" from a faucet from an unnamed hotel. The Luke's saber is a real graflex. The Vader is an Marco Enterprises saber I bought 11 years ago.